Axial split casing for horizontal or vertical installation fitted with a double suction impeller. 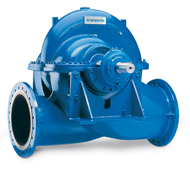 A comprehensive range of pump sizes and different impeller options maximize the operating economy. The Z22 range provides reliable performance for applications in district heating systems, thermal power plants, water and sewage works, etc. Click the button below to add the Scanpump split casing pump Z22 to your wish list.